We have been waiting for so long, but Game of Thrones is finally back! We are finally going to know who wins the throne! These are going to be jam packed, don’t miss episodes, so we decided we wanted to help you prepare for the next six Sundays with a Game of Thrones SVG Bundle! 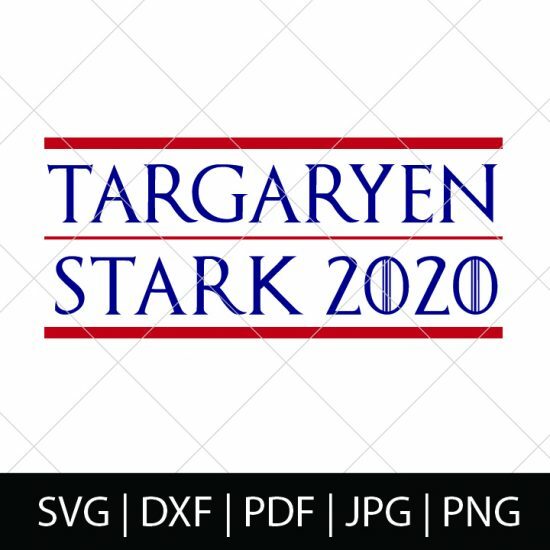 GAME OF THRONES SVG FILES! I don’t know how many households can’t say this these days, but we are a Game of Thrones household and have been for a long time. It might not sound super romantic, but The Song of Fire and Ice series actually played a large part in our honeymoon as we laid pool and sea side reading the books. We’ve read them all and while we’re still anxiously awaiting that conclusion – to which I honestly think we will never get one – we are finally getting the conclusion for HBO Game of Thrones! Can you believe it?! After two two years, we are finally going to know how it all ends. Will Dany succeed? Will the Starks stay together? How will we defeat the Ice Dragon and Night King? How will Cersei finally meet her end and will it be literally at the hands of Jamie? Is Tyrion a Lannister? And how are Jon and Dany going to feel about their family connection? Game of Thrones seriously has so many questions, family connections and prophecies to answer and fulfill. With only a little time left before it all begins, tell me what you think!! I want to know your theories, especially about who will sit on the thrown at the end. 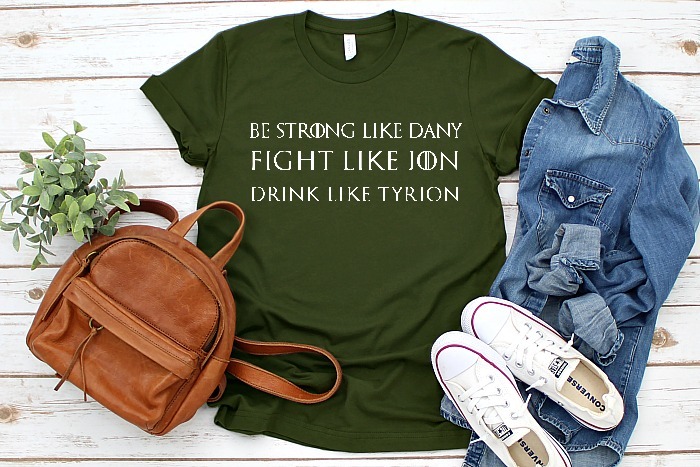 With the time you have left, you should also jump on this Game of Thrones SVG Bundle so you can make viewing shirts for yourself and your friends! Don’t want a shirt? Make a wine glass, a coffee mug, or even a cell phone case embellishment. There is no limit to the nerdy fun with these! GET YOUR GAME OF THRONES SVG BUNDLE NOW!!!! 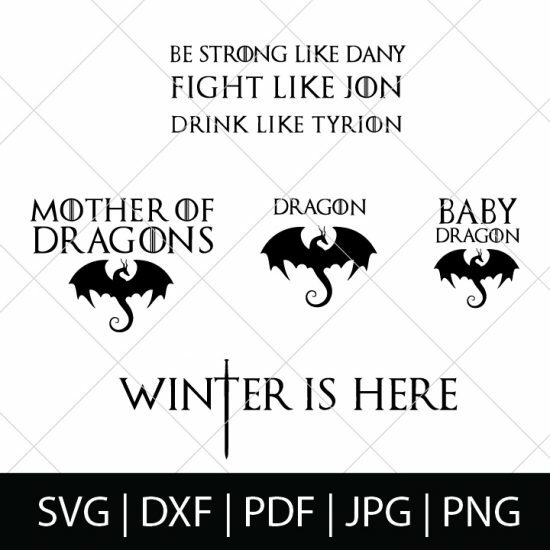 For this Game of Thrones bundle, you will get all the SVG files that can be used with any electronic cutting machine, like the Silhouette Cameo and Cricut Explore as well as PDF and JPEG for making cute print files. The Winter is Here design would be perfect for making a Game of Thrones viewing party invitation for your friends! Best part? It could be sent electronically if you aren’t super crafty! And the dragon shirts! How cute are those as Mommy and Me Shirts?! DIY Vinyl Shirts are definitely my favorite nerdy craft because they are easy to make, easy to customize and so darn cute! I get comments all the time about our nerdy shirts! We are not just offering this Game of Thrones cut file bundle. 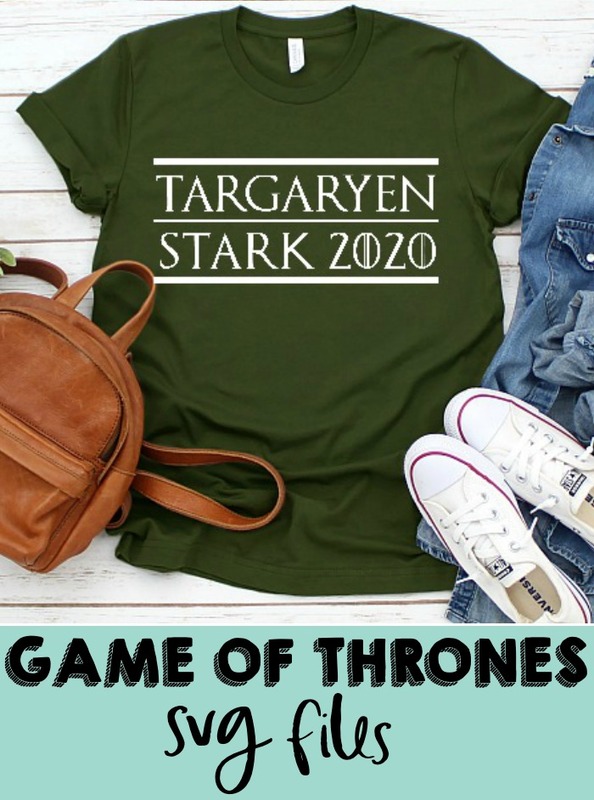 We are also offering a design for all the Dany and Jon fans out there with a VOTE TARGARYEN AND STARK 2020 shirt! If you are looking do complete other projects, like mugs or glassware, use regular vinyl for glassware, mugs, frames, or ornaments – Vinyl Color Pack. Ice Dragon Cocktail – Perfect to sip on during the Game of Thrones premier! Sansa’s Lemon Cake Milkshake – A fresh, citrus milkshake you will love! Sansa’s Lemon Cakes – My favorite lemon dessert for spring and summer! It’s actually perfect for Easter this year for TWO reasons! White Walker Cocktail – A frozen, boozy mudslide milkshake that is a favorite of mine!